The log line for Babes on a Bus, Fox’s new reality dating show pilot: “At each stop, the women will be introduced to the town’s finest bachelors, who will be on hand to impress them with romantic scenery and delicious local food. They even will introduce the ladies to their family and friends. 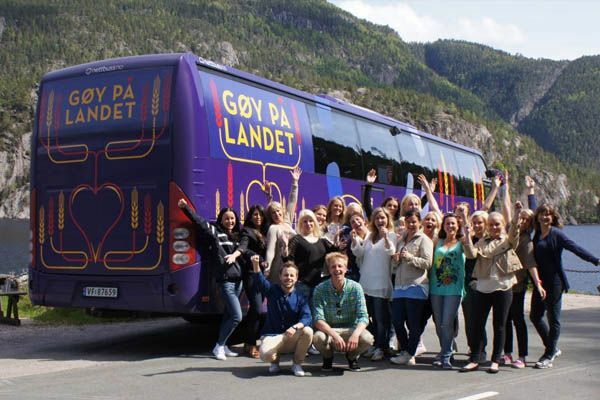 At the end of each week, the women choose whether to board the bus headed for the next town — or stay.” So it’s a television show that positions single women as sexual vikings, via Norway, no less. I have no problem with this, and neither should you. Here’s Justin Vernon (a.k.a. Bon Iver a.k.a. 2012 Best New Artist Grammy winner) consoling Grizzly Bear’s Edward Droste on the 10th most shocking Grammy snub of the day. Lots of frowny emoticons, alternate spellings of “Grammy/Grammys,” and cringe-inducing references to “our world” at the link. Magic Mike/21 Jump Street/The Vow star and all-around 2012 MVP Channing Tatum is taking a break from acting next year so he can focus on his directing career. Dude. The world names you Sexiest Man Alive, which is the Hollywood equivalent of a Nobel Prize, and your response is, “Cool, guess I killed that one. I think I’ll pick a new job that doesn’t require me to take off my shirt!” That’s like Marie Curie quitting chemistry so she can focus on her Etsy shop or something. They say Method actors never truly get out of character: Here’s Emile Hirsch employing the survivalist skills he picked up in Into the Wild by relieving himself on a cactus outside a West Hollywood nightclub.